Onion being a vegetable that has antiseptic, therapeutic and catalytic qualities can be used to aid the cure of many diseases and reduce the cooking period of many dishes respectively. Onion has a low calorific value. As a catalyst it is used to reduce the cooking time of the following dishes: Beans, Rice and beef. In addition, it tenderizes the beef by reducing its toughness. 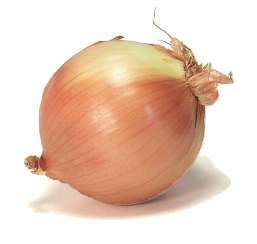 Onion is also used as a spice in cooking Soup, Stew, Rice Plantain and Green leafy vegetables (e.g. Spinach). When onion is used as a spice in these dishes it improves the taste, flavour, and aroma. It is also used for garnishing many types of dishes e.g. Jollof rice, Beans, and Grilled fish. It constitutes a large portion in Salad making. In spring or green onion, both the bulbs and leaves are edible. Its antiseptic and therapeutic qualities assist in curing the following diseases: Asthma, Bronchitis, Pnuemonia, Influenza and Cold. Victims of Tuberculosis have been reported to improve considerably as a result of heavy consumption of onion. Onion has helped bring about improvement in cases of Low Blood Pressure, and Obesity. It also aids the destruction of worms and other parasites in the body. Crushed onion poultice applied to the chest has been reported to relieve cases of Pleurisy (inflammation of the lung) and boils on the skin. Onion is very good for diabetics because it contains allyl propyl disulfide, which lowers blood sugar levels by increasing the amount of free insulin available. (1.) 2 medium onions (thinly sliced). (2.) 1 table spoon butter. (3.) 1 cup of water. (4.) ½ teaspoon pepper. (5.) 1 ½ cups of cream sauce. (1.) Fry onion lightly in butter. (2.) Add pepper, salt and water allow to boil. (3.) Add 1 ½ cups cream sauce. (4.) Heat for 1 ½ minutes. (1.) 2 dessert spoons margarine. (2.) 2 dessert spoons flour. (3.) ¼ teaspoon salt. (4.) 1 ½ cups of milk. (1.) Melt butter in sauce-pan, using low heat. (2.) Add flour and salt, blend well. (3.) Add milk, stirring constantly with wooden spoon. (4.) Cook for 2 minutes. (1.) 3 green onion stalks. (2.) 1 dessert spoon margarine. (3.) 1 teaspoon flour. (4.) ¼ cup milk. (5.) 2 eggs. (6) ¼ teaspoon spices. (7.) Salt to taste. (1.) Cut onion stalk in small pieces. (2.) Fry well in melted margarine. (3.) Sprinkle flour and cook until change in colour. (4.) Add eggs mixed with milk; salt and spices. (5.) Cook for ten seconds and serve. (1.) 2 large onions. (2.) 2 teaspoons cold minced meat or sausage meat. (3.) I dessert spoon bread crumbs. (4.) ½ mixed salt and pepper. (1.) Parboil the onions in boiling water. (2.) Drain and remove centre of onions. (3.) Melt butter, add meat crumbs seasoning and chopped centre of onions. (4.) Use the mix to fill the centre of onions. (5.) Wrap the onion in foil or brown paper and bake in moderate oven temperature until tender. (6.) Remove paper and serve hot. (1.) Few carrots. (2.) 2 tablespoon of beans. (3.) Small bunch of lettuce. (4.) 1 medium sized onion. (5.) 2 tablespoons salad cream. (6) 2 medium sized onions. (7.) Sugar to taste. (8.) 1 egg. (1.) Wash and drain all the vegetables. (2.) Cut them into required sizes. (3.) Prep the salad cream. (4.) Arrange them into layers and add the salad cream alternatively. (1.) 1 cup of beans. (2.) ½ medium sized onion (sliced or chopped). (3.) Enough water for boiling. (4.) Salt to taste. (1.) Bring water to boil in a sauce-pan. (2.) Add the beans and the onion. (3.) Cook for 25 minutes and add salt. (4.) Continue cooking for another 20 minutes or more until beans are soft. (5.) Serve with fish or shrimp sauce. (1.) 12 medium pieces of tough beef. (2.) ½ medium sized onion. (3.) Enough water for boiling. (4.) Salt to taste. (1.) Cut, wash and put beef in the sauce-pan. (2.) Add sliced onion, salt and other seasonings. (3.) Cook until beef is soft. (4.) Use as desired in soup or stew. Also for more information on Top Secret Restaurant Recipes guide, visit [http://www.recipes-tips.com/]; you will be amazed when it comes to Cooking and so many Restaurant Recipes Secrets that will give you courage to perform magic and wonder whenever you enter the kitchen. For more clues on Cooking and Recipes tips, check [http://www.recipes-tips.com/].